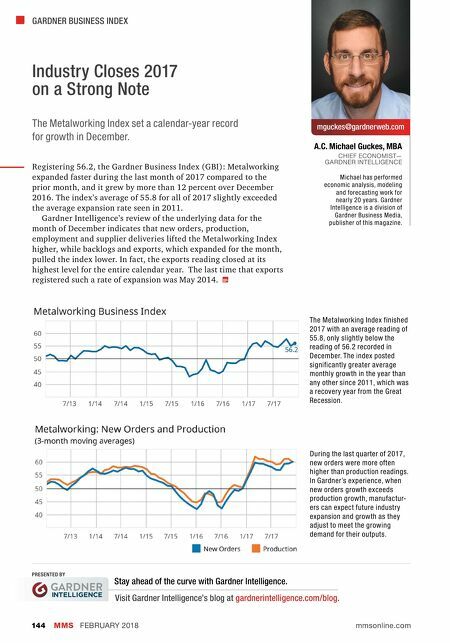 GARDNER BUSINESS INDEX MMS FEBRUARY 2018 144 mmsonline.com A.C. Michael Guckes, MBA CHIEF ECONOMIST— GARDNER INTELLIGENCE mguckes@gardnerweb.com Industry Closes 2017 on a Strong Note The Metalworking Index set a calendar-year record for growth in December. Michael has performed economic analysis, modeling and forecasting work for nearly 20 years. Gardner Intelligence is a division of Gardner Business Media, publisher of this magazine. Registering 56.2, the Gardner Business Index (GBI): Metalworking expanded faster during the last month of 2017 compared to the prior month, and it grew by more than 12 percent over December 2016. The index's average of 55.8 for all of 2017 slightly exceeded the average expansion rate seen in 2011. Gardner Intelligence's review of the underlying data for the month of December indicates that new orders, production, employment and supplier deliveries lifted the Metalworking Index higher, while backlogs and exports, which expanded for the month, pulled the index lower. In fact, the exports reading closed at its highest level for the entire calendar year. The last time that exports registered such a rate of expansion was May 2014. The Metalworking Index finished 2017 with an average reading of 55.8, only slightly below the reading of 56.2 recorded in December. The index posted significantly greater average monthly growth in the year than any other since 2011, which was a recovery year from the Great Recession. During the last quarter of 2017, new orders were more often higher than production readings. 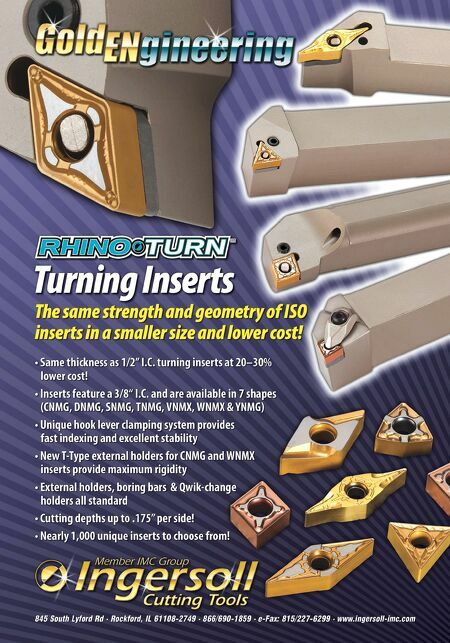 In Gardner's experience, when new orders growth exceeds production growth, manufactur- ers can expect future industry expansion and growth as they adjust to meet the growing demand for their outputs. PRESENTED BY Stay ahead of the curve with Gardner Intelligence. Visit Gardner Intelligence's blog at gardnerintelligence.com/blog .